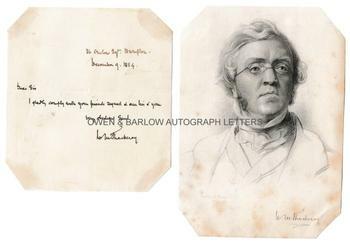 WILLIAM MAKEPEACE THACKERAY Autograph letter Signed. British (English) novelist. Author of 'Vanity Fair', etc. ALS (ANS). 1p. 36 Onslow Square, Brompton. December 9th 1854. To "Dear Sir". Together with a steel engraved portrait. "I gladly comply with your friend's request and am his and your very obedient servant, W. M. 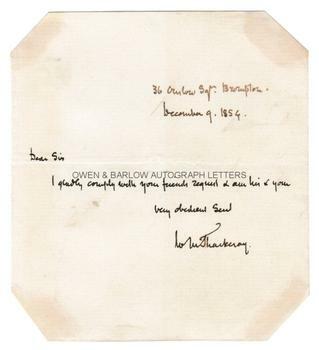 Thackeray." 12 mo. Approx 5 x 4.5 inches (12.5 x 9 cms). Old central fold. Trimmed top and tail and with corners cropped to fit album but with no loss to text. 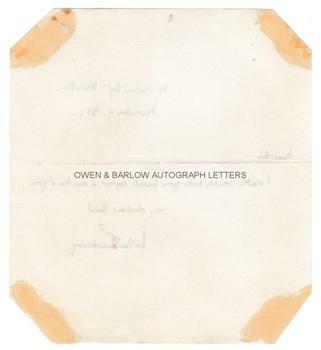 Mounting traces to corners of verso. 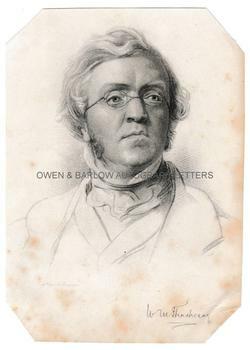 A nice example of Thackeray's small, upright hand. Provenance: From the 19th century album compiled by the family of Dr James Copland FRS (1791-1870), the Scottish physician and noted writer on medicine.